Toddler & Preschool Storytime: Arctic and Antarctic Animals! Way Up in the Arctic is one of a series of books by Jennifer Ward and Kenneth J. Spengler which explore different animal habitats by using the old, traditional tune "Over in the Meadow" as a springboard for awesome literary creativity :) If you have a young nature lover at your house, check out some of the other books in the series! 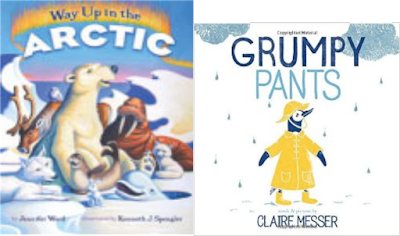 I just can't use Grumpy Pants with one storytime group and not the other, it just wouldn't feel right, so we read Grumpy Pants at T&PST as well as at FST :) For one thing, we needed an Antarctic animal book, and what better animal to highlight than the penguin? But more importantly, this is one of the more delightful books about how to cure the grumpies that I've ever read :) This book is a storytimer's gold mine: it talks about 1. penguins, 2. feelings, 3. bathtime, 4. underpants, and 5. Happy Bedtime Rituals. What more could one ask of a children's book?? My favorite thing to do with this book is follow it with the song, "If You're Grumpy and You Know It". I won't bother to put the words down here, because you already know what they are ; ) haha! But if you are feeling un-creative, (and maybe a little bit grumpy yourself?) and want the words, look here: If You're Grumpy... Have fun with it! Animals in the Arctic and Antarctic! How did you move? I like pretending I have giant paws when the polar bear "lumbers." Plus, that's a great word isn't it? Lumbers? We used blue construction paper, white chalk, white crayons and cotton balls. As you can see, there are many potential ways to utilize each medium. You can make an art lesson out of this type of project by talking about the various ways the different elements you are working with look and feel on the paper :) Pull the cotton balls apart! Rub the chalk! Make your bear plaid or polka dotted! I used each medium for three different bears. Can you think of some other combinations? Well, as I told the patrons that were at storytime today, our last Toddler & Preschool Storytime for the session is next Tuesday the 12th. I'm gonna miss you guys!! So you better keep on coming to the library ; ) Come to say hello, and get out books and movies and music, but also to sign up for our Winter Reading Challenge. It's a great way to keep everybody in the literary loop during the winter breaks from school! But any age can sign up. Find out more about that when you come in next. P.S. Here's a great booklist!